Your Happy HIPAA Book - Veterans Press, Inc.
You may have some difficulty with the association of the word “happy” with the acronym “HIPAA,” short for the Health Insurance Portability and Accountability Act of 1996. On the other hand, you might have to associate the word “unhappy” with HIPAA if you are audited by the Office of the Inspector General (“OIG”) of DHHS or investigated by the Office for Civil Rights (“OCR”) as a result of a complaint and do not have the required documentation of HIPAA compliance. A truism is that for HIPAA, if it is not written, it’s not. If you don’t have written training records, you didn’t train your workforce. If your policy is merely oral, it doesn’t exist for HIPAA compliance purposes. 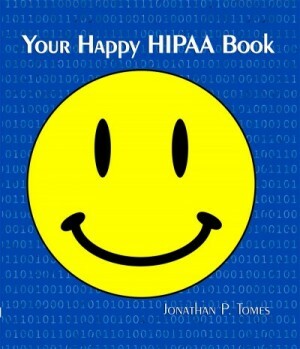 Your Happy HIPAA Book has convenient tabs dividing the sections. Each tab in this book has an explanation of what belongs behind each tab and why, and many tabs have tools to help you develop Your Happy HIPAA Book. Further, each tab includes a checklist for that tab so that you can more easily see what you have done and what is left for you to do to fill that particular tab. The Preface includes an overall checklist to help you keep track of which tab you were on the last time that you worked on filling up Your Happy HIPAA Book with the written documentation that you will need to prove that you and organization are indeed HIPAA compliant.